Premium Sound by Bowers & Wilkins (Volvo S90) review | What Hi-Fi? The standard audio system for the S90 is a 10 speaker, 330W set-up, which Volvo calls its "high-performance" offering. In contrast, Premium Sound by Bowers & Wilkins is a £3000 option using 19 speakers, a 12-channel amp and 1400W of power. On paper, it seems pricey for a boost in power and a sprinkling of extra speakers, but this is only half the story. 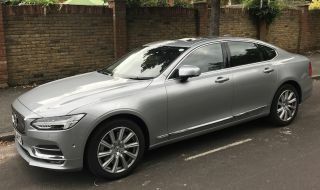 The drive units in the S90's standard system are limited to the front and rear doors, plus the rear parcel shelf. The rear doors only have one driver in them, whereas the B&W system (pictured above) covers all bases, with an aluminium tweeter, Kevlar midrange driver and bass unit in all doors, (and a separate, carbon-fibre subwoofer in the rear). There's also B&W's party piece, the tweeter-on-top, which protrudes proudly from the middle of the dashboard. The aluminium dome fires high frequencies out towards the listener: it's positioned this way to reduce reflections from the windscreen and, together with the other tweeters in the system, it uses a special arrangement of diffusers behind to soak up reflected sounds and reduce vibrations. But it's not just an improved calibre of speaker you get with the B&W system. The level of audio processing wizardry at your disposal is much more advanced. You've the usual tone and balance settings to play with, but the Bowers set-up adds three custom-designed processing modes into the equation, accessed via the Sound Experience icon on the Volvo's touchscreen. Each mode claims to offer a different style of presentation for the listener. Studio mode alters the sound so it can be focused on either the driver, everyone in the car, or just those in the rear. Volvo claims it produces a drier, more precise listening experience. We find the soundstage sounds a little purer and more regimented - it's much more apparent sound is coming from the speakers housed in the doors. Individual Stage allows you to manipulate two elements of the system's acoustics: Intensity and Envelopment. The former relates to the perceived closeness and depth of the sound field. It's a case of do you want the sound coming at you from the leading edge of the dashboard, or from the rear? The latter alters width, so you can encourage the system to produce a simpler or more immersive soundstage. Like adding seasoning to your favourite steak (or salad), simply use the sliders on the touch-screen to fine-tune each setting to taste. The final mode doubles as a nod to Gothenburg, the home of Volvo. Named Concert Hall, the setting is supposed to recreate the acoustics from the famous Gothenburg Concert Hall. In reality, it's a nice touch and a neat piece of marketing, but it doesn't produce the most convincing audio. Genres such as rock, pop, hip-hop or R&B don't really suit it, and even classical tracks struggle to sound natural. During our time with the car, we gravitate towards the Individual Stage setting, which we feel gives the best balance of precision and immersion. We were fortunate enough to be able to listen to the Volvo's standard system before swapping over to a B&W-equipped car. The difference is night and day. Immediately you're aware there's more detail making it through, and greater care and precision with the way audio is served into the cabin. You hear a fuller, more truthful account of the information on a track whether you're using the built-in CD player or a Spotify account. Integration between all the speakers is excellent - even the subwoofer in the back of the car doesn't feel too distant. Lows are weighty and full-bodied, but don't sacrifice much in terms of tautness or punch. The tribal drum beat that pounds along to the Foo Fighters Run sounds solid and resolute. Certain details in the standard system fight hard to be heard, but here they come through loud and clear. The soundstage sounds fuller and more refined, and the presentation is all the more interesting for it. Where high frequencies are concerned, the tweeter on top makes a big difference. It not only make treble sounds clearer but it also adds to the quality of those notes, bringing greater texture and realism. Another positive is there's no sign of any harshness or brightness. The whole tone is geared towards an easy listen which makes the system a breeze to live with to during long motorway slogs. The only downside is that dynamically, the B&W system doesn't quite have the impact and drive we'd like. Drum thwacks feel a tiny bit hesitant, and highs could do with more of a cutting edge. The Bowers & Wilkins system for the Volvo S90 isn't the strongest system we've heard inside four doors - we'd like it to sound a bit more outgoing in absolute terms. But in a shootout between this and the standard S90 set-up, there's only one winner. The jump in quality is obvious, even if yours is an untrained ear. It sounds superior, and the level of processing on offer, on the whole, really comes in handy for fine-tuning. If you're thinking of skipping or ignoring the B&W audio option we'd suggest reconsidering, or at least listening to it for yourself.